Welcome to the latest edition of This Weekend in Michigan Wine, a listing of what's happening now, what's coming up and what's ongoing in the world of Michigan wine! We regularly check dozens of wine websites and sift through tons of weekly press releases to round up what's scheduled around the state. Wineries, if you'd like your event listed, please email us with all of the pertinent information, and we'd be happy to post it. MBTB fans, we hope this serves as your weekly "go-to" guide for finding the best options for getting your Michigan wine on! Cheers! We advise checking with the wineries listed to verify that these recurring events are still going on at the time you plan to visit! Know of a cool event? Want yours listed? See something that needs correcting? Email us! 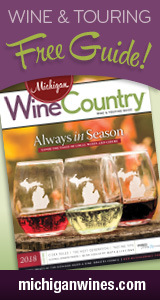 We strive to be your definitive source of information on Michigan wines; therefore, we welcome you to link to this page or print an excerpt that leads back to our site. However, as our work is copyrighted, we kindly ask that you do not copy and paste This Weekend in Michigan Wine or any other portion of Michigan By the Bottle in its entirety on another site. We appreciate your cooperation. For reprint inquiries, please email wine@michiganbythebottle.com.